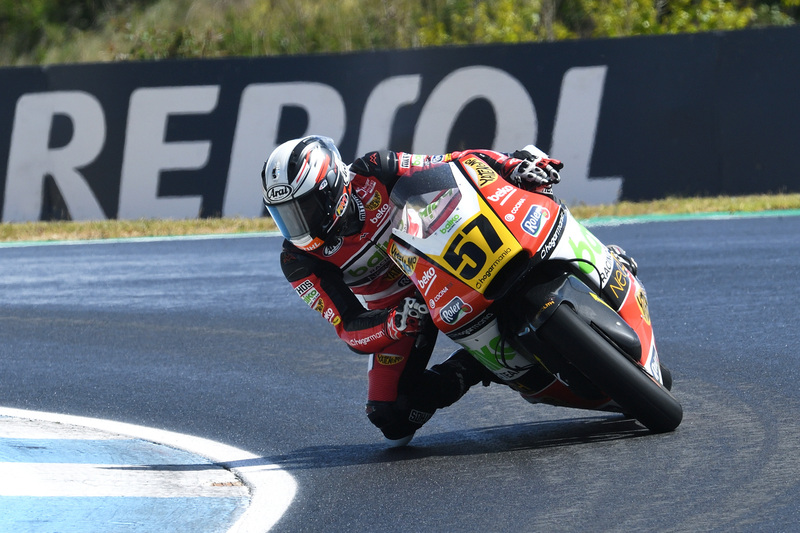 Once again the Estoril Circuit is hosting the start of a new FIM CEV Repsol season, where changing weather conditions today affected and even briefly halted the qualifying sessions due to a hailstorm. Even so, the competition program went ahead, with Jeremy Alcoba (Laglisse Academy) achieving pole position in Moto3™, Edgar Pons (Baiko Racing Team) in Moto2™ and José Antonio Rueda (Talent Team Estrella Galicia 0.0) in the European Talent Cup. Jeremy Alcoba underlined his claim for the Moto3™ Junior World Championship title by taking the first pole of the season with a time of 1: 47.214. The Laglisse Academy rider beat Deniz Öncü (Red Bull KTM Ajo) by just 0.058 in the second qualifying session with Carlos Tatay (Foundation Andreas Pérez 77) closing out the first line of the grid. Reigning ETC champion Xavier Artigas (Leopard Impala Junior Team) will lead the second row of the Moto3™ grid followed by Barry Baltus (Sama Global Angel Nieto Team) and José Julián García (Fau55 El Señor de las Bolsas), although these last two finished Q2 0.8 seconds behind the poleman. Other possible title contenders such as Yuki Kunii (Asia Talent Cup) and Aleix Viu (Sama Global Angel Nieto Team) – who took part in the last GP Motul of the Argentine Republic – finished further back. In Moto2™ Edgard Pons showed the other riders a clean pair of heels with a time of 1: 54.440 in Q2, 1.294 seconds ahead of his immediate pursuer Niki Rikhard Tuuli. The Finnish Team Stylobike rider in turn held off Kasma Daniel Bin Kasmayudin (Dynavolt Intact SIC Junior Team) by just 0.020. Gerry Salim (Astra Honda Racing Team) finished with the fourth best time of the day ahead of Tommaso Marcon (Team Ciatti), while Héctor Garzó (CNS Motorsport), another contender for the Moto2™ title, only managed sixth. With 60 ETC riders having signed up for the whole season, there were two groups in the ETC classifying sessions; José Antonio Rueda was the fastest in Group A with a time of 1:49.931 posted in the second session. Izan Guevara (Cuna de Campeones) was second, 0.404 behind Rueda and Iván Ortolá (Sama Global Angel Nieto Team) third, trailing the poleman by 0.868. In Group B, Roberto García (Fau55 El Señor de las Bolsas) achieved the best time of 1: 50.202 followed by Fenton Harrison Seabright (Wilsons) and Diogo Moreira (Talent Team Estrella Galicia 0.0). José Antonio Rueda will head the ETC starting grid thanks to posting the best time overall. Roberto García, the quickest rider in Group B should have taken second place on the grid: however, he was penalized for being below the allowed weight, thus leaving the second slot to Fenton Harrison Seabright; in third place will be Izan Guevara as the second placed rider in Group A; in fourth, the second placed rider in Group B, Diogo Moreira, and so on. One of the innovations of this season is the ETC Series 2 race, for riders who fail to classify for the official ETC race. The ETC Series 2 race will close the race program on Sunday at 4:00 pm. Viñales penalty: a victory costing mistake?